The 1st Indonesia Model World Trade Organization (abbreviated as Model WTO) is an academic simulation of the World Trade Organizations that aims to educate participants about civics, current world events, effective communication, globalization and multilateral trade diplomacy. In standard Model WTO, students take on roles as diplomats and participate in a simulated session of a ministerial conferences and any current committee under specific trade issues. Participants research a country, take on roles as diplomats, investigate international trade issues, debate, negotiate, deliberate, consult, and then develop solutions to world trade problems. 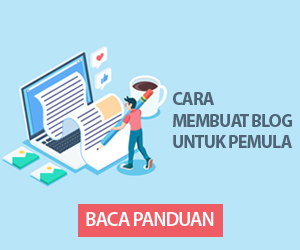 The concept of the 1st Indonesia Model World Trade Organization (WTO) has grown substantially all across the world, with various third-world and traditionally non-English speaking nations joining in. One example of this is 1st Indonesia Model World Trade Organization (WTO) where it is going to be held on December 6th – 8th, 2013 in Universitas Gadjah Mada, Yogyakarta. The 1st Indonesia Model World Trade Organization (WTO) which is the biggest Model WTO in Indonesia. 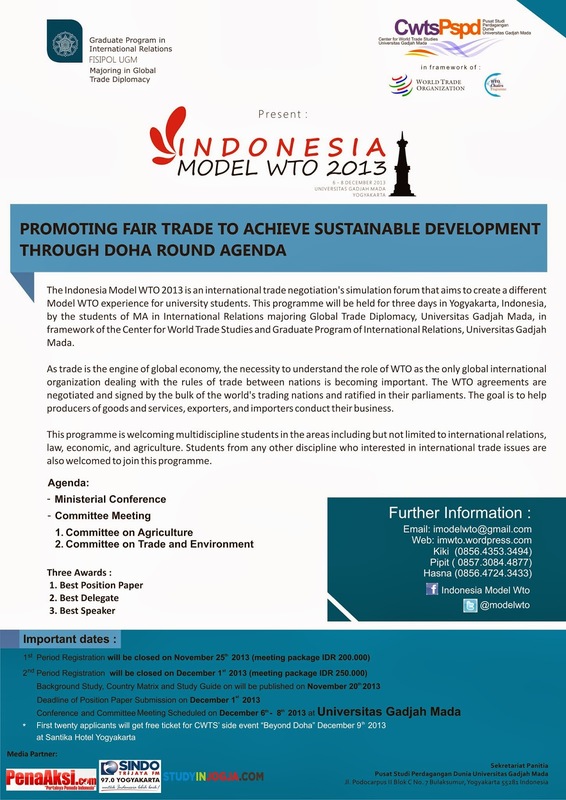 It is with a great honor that Indonesia WTO could greet all youth around the globe in 2013. This year 1st Indonesia Model World Trade Organization is initiated by Student of Global Trade Diplomacy Studies, Master Program of International Relations Department UGM in collaboration with Centre for World Trade Studies (CWTS). As the pioneer, it definitely will bring a richer experience for all delegates of the 1st Indonesia Model World Trade Organization as our goal as the organizing committee is to give all delegates an unforgettable experience in Yogyakarta. As we know, global trade problems come and go as time goes by. This year, 1st Indonesia Model World Trade Organization (WTO) would like to set its focus to The Doha Declaration to solve problem regarding agriculture, service, and intellectual property. From these three main issues, only agriculture which left unsettled, far behind intellectual property rights and even for service. The Doha development round of trade talks initially started in 2001 with the aim of remedying inequality so that the developing world could benefit from free trade. The talks have repeatedly collapsed as developed nations failed to agree with developing nations on terms of access to each other’s markets. The negotiations are described as a “single undertaking”. This means their objective has been to form a single package of about 20 subjects, to be signed by each country with a single signature without any option to pick and choose between different subjects. Until the Doha Round concludes, this collection remains a work in progress. The declarations that WTO members adopted in Doha set up a work program, the Doha Development Agenda, which includes trade negotiations and the issues arising from the implementation of the existing agreements. In Doha, ministers also decided to postpone the deadline for some developing countries to eliminate export subsidies. The original aim was to reach an agreement on almost all subjects in the negotiation by January 1st 2005, but those deadlines were missed. Corresponding to these concerns, WTO includes trade related issues such as environment which has close relation with sustainable development. It is because economic cycle will highly affected by the ability of human to maintain and sustain their natural resource and environment. Another important issue included in Doha Round is agriculture which puts its urgency due to large number of member countries depend on agriculture trade activity as the backbone of their economy. Based on this consideration, the 1st Indonesia Model World Trade Organization chose “Promoting Fair Trade to Achieve Sustainable Development through Doha Round Agenda” as its theme, as an attempt to understand trade challenge in this contemporary economy. To deepen the understanding, the negotiation will be conducted in committee setting which took place in Committee on Trade and Environment and Agriculture. 1. Indonesian Student of Undergraduate and Master Program from any faculty.